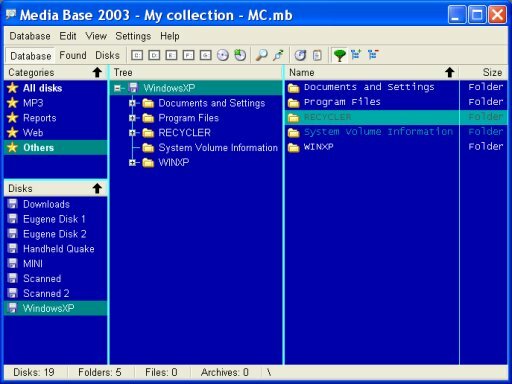 Media Base is a disk catalog program for Windows 95/98/NT/ME/2000/XP. With Media Base you can simply catologize all your media disks, search files in archives, extract short notes from text files and extract extra-information from each file. 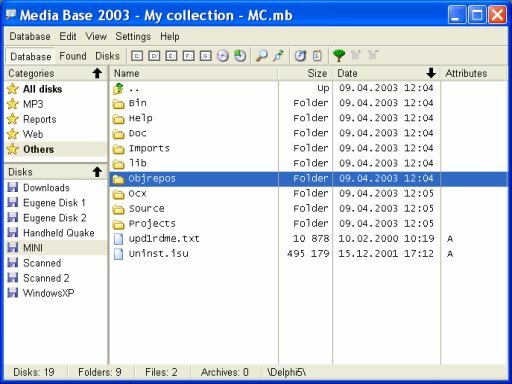 Media Base [Version 1.7 from 30.06.2004]. Hit the link to download Media Base disk catalog. Notice: You should extract the archive to the empty directory, i.e. without old version. Supports database size up to 2GB with 65,536 disks. Uses standart panel organization, like Explorer. True-Coloured icons in menu and toolbar. Quick file search by name, date, size, attributes, CRC32. Duplicates search by CRC32 or by name & size. Indexation of executable files (*.exe, *.dll, *.ocx, *.bpl). Reading version information. Indexation of MP3 files. Tag reading from versions 1.0, 1.1 and VBR. Extracting notes from text files with searching and viewing notes. Multilingual interface (English, Russian, Ukrainian). Speed of disk scanning is increased. You change size of font in "View" menu. Now shown buttons only for accessed disks. New option in settings "Double click in file list". Base settings saved in base file. Now you can set settings for every base independently. Fixed work of FAR Plugin MediaBase_FAR.DLL. Two language support (Russian and English). Showing file info after pressing F3 or Ctrl+Q. Searching files by CRC32 on Alt-F7. Fixed bug (files duplicate) when scanning some types of archives. Fixed bug with scanning SFX-archives. Improved plug-in MediaBase_FAR.DLL. Support added for old version of FAR 1.65. Impovements in switching between panel modes. Bug fixes. New extra-columns added to the file lists. For example, you can show "Duration" column of the MP3 file. Summary of all extra-fields added to page "Extra" of the "Selected properties" window. For example, you can determine total duration of the selected MP3 files. Now you can change columns in status bar. Added extra-columns. Added summary for every field for selected files in status bar. Extract extra-information from EXE files. Extracting VersionInfo. Supporting EXE, DLL, FON and some other formats. In window "Database settings" added new page "Extra" for settings of extracting extra-information from files. "Show tool tips" options in "Program settings" window can disable tool tips for file lists. Added hot keys for many menu items. Improved splitter between categories and disks. Popup menu added to "Disk properties" for lists. For file lists added commands for export list to file with HTML, RTF, CSV and TXT formats. And copy list content to clipboard. External archivators support. All settings saved in Custom.ini file from Custom.fmt plugin. 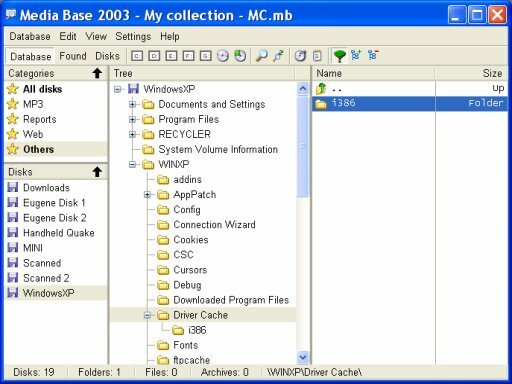 file catalog, catalog of disks, catalog of files, disks catalog, files catalog, disk organizer, file organizer, disks organizer, files organizer, cd catalog, catalog cds, cataloging cds, cataloging software, disk catalog, disc catalog, disk, disc, organize, catalog, catalogue, disk catalogue, diskcatalog, cd, catalog, cds, catalogue, folder, search, report, duplicates, jaz, CD-ROM, cdrom, CD, magnetooptic, magnetooptical, removable, media catalog, zip.